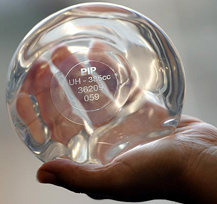 PIP Implants were not FDA approved and therefore have never been used by Dr. Becker. They were made with inferior grade silicone and have a higher rupture rate. It has been recommended that these implants be Removed or Replaced. Dr. Becker’s office is offering free consultations and financial assistance to patients who have PIP Implants.